Take a deep breath and relax – You have arrived in Asheville’s first and original Salt Spa and Himalayan Salt Cave offering authentic Salt Therapy (Halotherapy)! It is going to be a different Spa experience at The Salt Spa of Asheville & Himalayan Salt Cave Sanctuary with spa packages and real, dry salt therapy you won’t find anywhere else in Asheville The moment you enter our Himalayan Salt Sanctuary, you can leave your stress and worries behind. Whether you come to experience Halotherapy in our Himalayan Salt Cave Sanctuary, a massage or our Far Infrared Salt Bed in our Himalayan Salt Wellbeing Room, you have come to nurture your body, mind and soul. As the first salt therapy spa in North Carolina we have introduced the therapeutic benefits and deeply relaxing nature of Halotherapy or dry Salt therapy. It is a natural approach to health and means breathing in a negative ion rich dry salt micro-climate like the ones found in natural salt mines. Breathing this dry salt air acts like a bronchial brush, cleansing and revitalizing our airways and the anti-inflammatory and anti-bacterial salt air is a natural defense mechanism to eliminate harmful bacteria and inflammation in our lungs. Developed by European Physicians interested in natural therapies, Halotherapy is the only salt therapy method scientifically developed, researched and proven to be effective. For us, Halotherapy is a lot more. We believe well-being is a matter of body, mind and soul and so we address them all. Naturally, we put a lot of emphasis on creating a safe and peaceful salt sanctuary here at The Salt Spa. 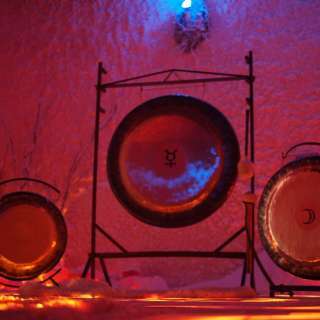 Our Himalayan Salt Cave Sanctuary was carefully built by the owners with 100% of only the best Himalayan Salt, sophisticated equipment to re-create the authentic dry salt, negative ion and mineral rich micro-climate of natural salt mines and an ambiance of serenity, relaxation and well-being. Our Himalayan Salt Wellbeing Room is another work of art and love. 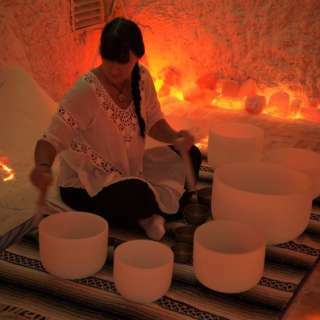 In this beautiful and intimate Himalayan Salt room, we offer massages, cranio- sacral therapy, energy work and our in house developed Far Infrared Himalayan Salt Bed. With the multitude of health services, our guests can experience either “one, two or three hours of Bliss” here at The Salt Spa, a tranquil retreat to allow the relaxation, healing and rejuvenation to unfold. Your blissful time at The Salt Spa of Asheville is only complete with the experience which all our guests enjoy – the peaceful sensation of our warm Himalayan Salt Foot Domes for a wholesome finale. We recommend advanced reservation. Our guests need to be non-smokers for at least 3 weeks of all substances.